KANCHANPUR, Oct 30: Women rights activists and locals resumed their protests on Monday, demanding justice for Kanchanpur teenager Nirmala Pant who was raped and murdered over three months ago. However, the protesters are now sharply divided into two major factions. After Nirmala’s dead body was found on July 27, protests demanding justice for her started from the very next day. Her relatives, locals and women rights activists participated in the protests. The protests intensified on August 21 when police tried to frame innocent Dillip Bista for the crime. 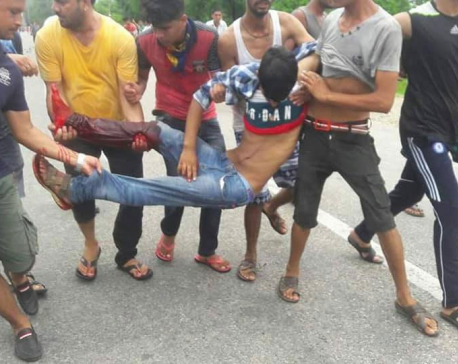 A 14-year-old Sunny Khuna died and numerous others sustained injuries in police action against the protesters. This incident divided the protesters who were initially united for justice for Nirmala. In the initial days, a struggle committee coordinated by Helen Shrestha led the protests. A few weeks later, another group was formed which was coordinated by Mina Bhandari. Despite carrying the same objective, the two women-led groups refused to accept the existence of each other as they vied for the helm. The division grew deeper after women rights activists of Bhandari’s team took Nirmala’s father Yagyaraj and mother Durgadevi to Kathmandu on September 10 without informing the other group. The factional division then became clearer than ever. Women rights activists of Shrestha’s team accused that Bhandari’s team prevented them from communicating to Nirmala’s parents and they switched off their mobiles during the period owing to their personal interest. Shrestha’s team is of the opinion that they need to create pressure locally and help in the investigation. They accused Helen’s team of taking Nirmala’s parents to Kathmandu to weaken the protests ‘under the strong influence of dollars’. After that, both the camps have organized protests differently. They have not participated in each other’s protest programs following the incident. While Bhandari’s team was in Kathmandu, Helen Shrestha’s team celebrated Teej in Mahendranagar wearing black sarees in order to draw attention to Nirmala’s case. Just a few weeks ago, they also demonstrated in Dhagadhi and submitted a memorandum to Chief Minister Trilochan Bhatta. Bhandari’s team did not participate in the initiative. Likewise, Shrestha’s team did not participate in the demonstrations held in Mahendranagar by Bhandari’s team. Shrestha’s team issued a statement saying they would not organize demonstrations during Tihar and Chhat festivals apart from meetings and lobbying. However, Bhandari claimed that there is no division between the two camps and said each of them is organizing protests in their own way.